English: "The Shadow War in Syria ..."
A book that explains how for years the CIA has sold weapons to its worst enemies -- Al Qaeda -- to try to overthrow Bashar al-Assad with the complicity of France and Saudi Arabia. A game of influence that has never been denounced. ~~ Timber Sycamore Operation [Wikipedia]. This code name does not tell you anything. It nevertheless denotes a gigantic shadow war, whose main objective was to overthrow Bashar al-Assad. Led by the CIA and its allies in the fall of 2011, and halted in the summer of 2017, this secret campaign attracted little Western media attention. However, it mobilized billions of dollars and tens of thousands of tons of weapons and ammunition, thus helping a rebellion whose most effective forces were linked or affiliated with al-Qaeda. 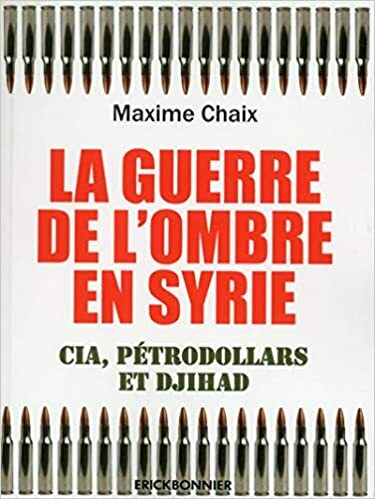 The result of five years of research, this book explains how Washington, London, Paris and their Middle East allies supported the anti-Assad jihadist nebula, including the "Islamic State". Questioning some of the greatest experts in Syria and the Arab world, the author describes how -- under the guise of supporting "moderate rebels" -- the Western powers and their partners have reinforced the same Islamist movement accused of the attacks of 11 September  and [13 November 2015 - Paris]. A striking and disturbing investigation, which challenges many of the accepted ideas about the Syrian conflict. ~~ Independent journalist, author and translator, Maxime Chaix holds a Master 2 "History, theory and practice of human rights". Specializing in strategic issues, intelligence, covert operations, US foreign policy and jihadism. He has published analyses in MiddleEastEye.net, Paris Match, GlobalGeoNews.com and Le Devoir in order to inform Western populations about the militarism of their leaders. He is particularly interested in the causes and consequences of the wars of regime change in Iraq, Libya, and Syria. Long War Journal's Thomas Joscelyn said it all in one sentence in 2017: "[T]here is no evidence that any truly moderate force is effectively fighting Assad." Those who poured money and weapons into Syria in the attempt to bring down the Syrian government always knew that any 'moderate' forces would easily be overwhelmed by the hard-core Islamist fighters. So calling those government leaders "militaristic" wouldn't describe what they are. But then there's nothing more useless than telling a demon, 'You know what your problem is? You're a demon.' They already know. "King Louis Philippe ordered the restoration of the church in 1848 ... The result was a work of such beauty that when revolutionaries of the Paris Commune wanted to destroy the cathedral in 1871, several artists talked them out of it." Stephen Stromberg, an opinion writer at the Washington Post, took to his keyboard yesterday to type a lament, "The Notre Dame Cathedral will rise again. But it will never be the same." Another WaPo typist intoned "The fall of Notre Dame is a body blow to Paris and all it represents." Obviously, the writer didn't know that Notre Dame is still standing, thank you very much. The cathedral has taken more than one body blow over the course of its existence, and to say it will never be the same is to be ignorant of the fact that the cathedral hasn't been the same for a very long time. Below, for the Washington Post's edification, is RT's great summary of the cathedral's trials and tribulations -- and triumphs -- over the centuries. So while WaPo was whining, RT was doing its homework. But before giving the floor to RT, I should like to remind Mr Stromberg that the most important part of the Cathédrale de Notre Dame Paris was untouched by the yesterday's devastation -- that part being the altar and its cross. I would count that as a Holy Week miracle, and a little reminder to the French that a cathedral is more than an art gallery. Notre Dame survived wars, revolutions and neglect. Then fire came. The April 15 blaze reportedly began in the scaffolding surrounding the spire, quickly spreading to much of the cathedral’s roof. Some two thirds two-thirdsf have caved in and the spire toppled over, causing further damage to Notre Dame’s interior. However, in the early hours of Tuesday, French firefighters said they might have managed to save the towers, leaving open the possibility that Notre Dame may rise from the ashes and be restored to its splendor once again. Sections of the cathedral were under scaffolding as part of the extensive renovations underway there, and 16 copper statues had been removed last week. “We consider the two towers of Notre Dame to have been saved,” Paris fire-service commander Jean-Claude Galler said at around 11 p.m., as firefighters were still working to contain the flames. The fire service said the fire had been reduced and it was a major accomplishment that the hundreds of firefighters had stopped the flames from spreading to the north tower belfry. However, the roof “had been ravaged”; around two-thirds of it had been destroyed. Fire brigade officers also said the structure of the cathedral was “saved and preserved” and that the fire had been successfully extinguished as the teams prepared to cool off the building. The cathedral’s altar and altar cross were also saved from destruction in the fire. The main loss was a 19th-century gothic spire and the wooden frame at the top of the 13th-century landmark, which was made from so many oak beams that it was known as “the forest”. A French journalist on the scene reported that the north rose stained glass window – La Rosace Nord – “seems to have held”. 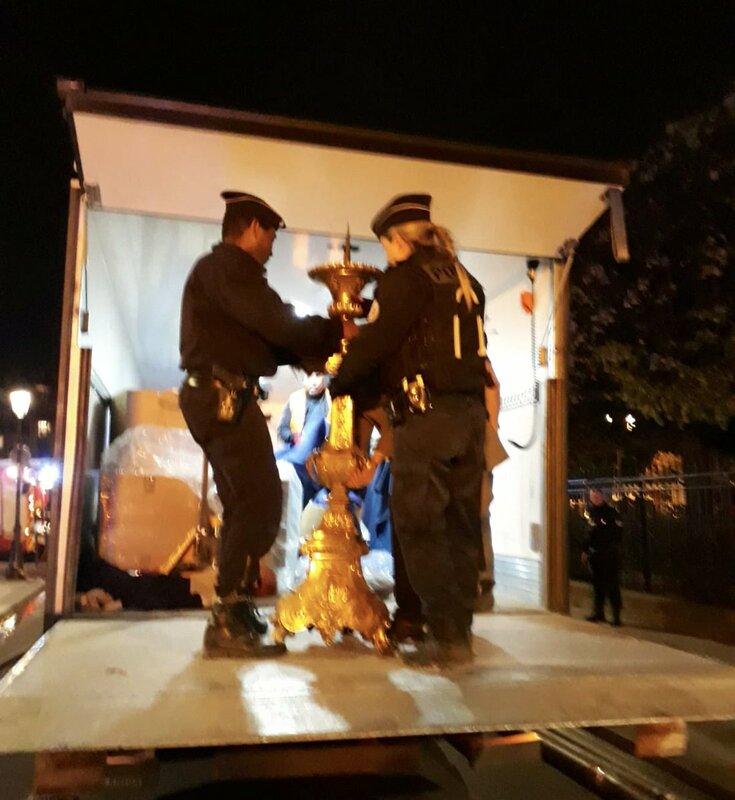 "Firefighters battled smoke and falling drops of molten lead to salvage priceless artworks and relics". Note Dame: Firefighters avert the worst. Damaged parts will be restored. Many treasures rescued. First photos from inside cathedral. "This cathedral, we will all rebuild together"
Despite the massive inferno, the clergy and the fire brigades have managed to save large parts of the Cathedral’s treasury, including many Christian relics. Firefighters also saved the two bell towers after the spire and most of the roof burned out and collapsed. 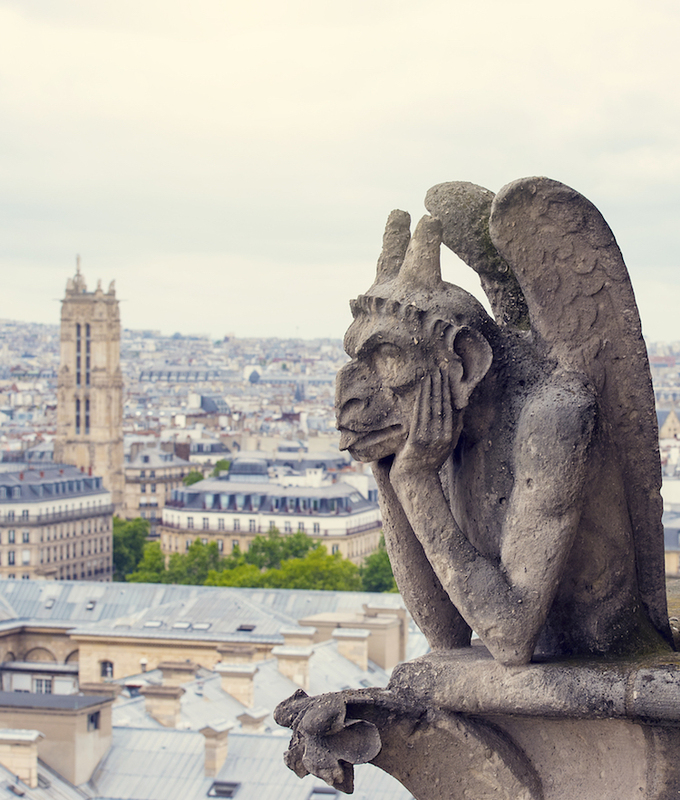 President Emanuel Macron has vowed to rebuild the Cathedral, promising to find the best international talents to restore the centuries-old landmark. After the ‘worst case scenario’ was avoided and firefighters managed to save the Notre Dame’s structure from total destruction, President Emmanuel Macron has vowed to restore the historic cathedral to its former glory. The chief architect in charge of the works at Notre-Dame, Philippe Villeneuve, also pledged to rebuild the national symbol. “We have rebuilt the cathedral of Reims after the bombing by the Germans during the First World War and today we still see in its splendor,” he said. While Macron promised to launch an international fundraising campaign, the Heritage Foundation said it will launch a “national collection” of funds for the reconstruction of Notre-Dame de Paris on Tuesday, after the tragic incident raised a wave of condolences around the world. Rebuilding the cathedral will take “years of work,” said Eric de Moulins-Beaufort, president of the Conference of Bishops of France (CEF). Meanwhile the Pinault family of the retail conglomerate Kering announced that it will donate €100 million for the reconstruction of the building. Hundreds of firefighters are still working the scene of the terrible fire, trying to preserve whatever is left of the world art treasures. The Crown of Thorns, one of the major reliquaries of the church, was saved from the inferno along with many other treasures, Bishop Patrick Chauvet, rector of Notre-Dame de Paris noted earlier. The altar and the cross also survived the fire, local media reported citing the mayor's office. While no one has died in the blaze, at least one firefighter was "seriously" injured trying to contain the fire, local media reported. 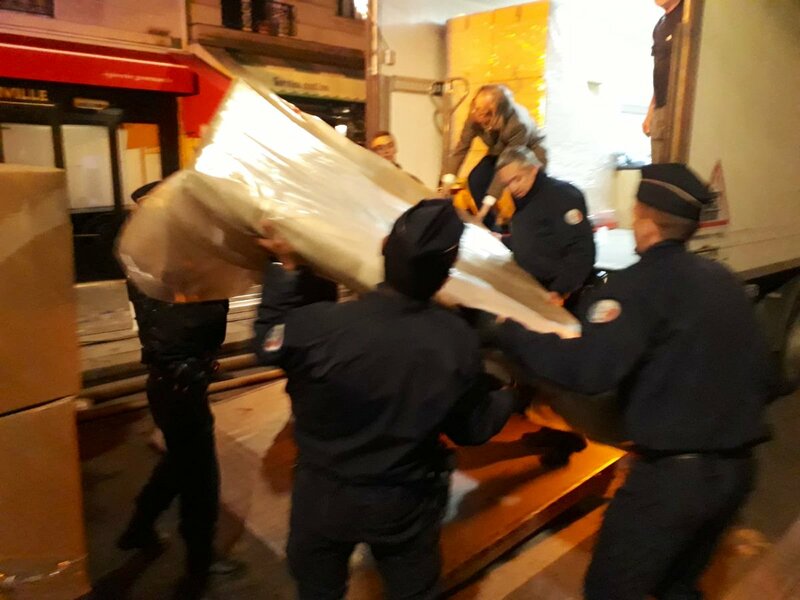 "Les agents du @MinistereCC, épaulés par les équipes de l’archevêché, les @PompiersParis et les forces de sécurité, évacuent les œuvres se trouvant à l’intérieur de la cathédrale. Elles sont progressivement mises en sécurité." Fire has destroyed two thirds of the roof of the iconic Notre Dame Cathedral in Paris, yet the French firefighters remain cautiously optimistic that they may have managed to save its two towers from collapsing. “We can consider that the two towers of Notre-Dame are saved,” commander of the Brigade of firefighters in Paris, Jean-Claude Gallet, told reporters. "Fire Brigade Chief Believes Firefighters Were Able to Save Two Towers of the Blaze-Hit Cathedral"
Headline is from Sputnik live updates, this one published 10 seconds ago. French firefighters have expressed doubts the devastating fire at the Notre Dame cathedral (Cathédrale Notre-Dame de Paris) can be stopped and have not ruled out further collapse of the iconic landmark. “We’re not sure we can stop the fire spreading into the northern bell tower – and you can imagine the damage if it collapses,” said Jean-Claude Gallet, the commander of the Paris firefighters. Over 400 people are combating the blaze. Earlier, the firefighters ruled out the possibility of using aerial support in fighting the devastating blaze. A fire at the iconic Notre Dame Cathedral in Paris, France has destroyed most of the roof and collapsed the church's central spire. Eyewitness videos show smoke and fire engulfing the jewel of Gothic architecture. The blaze broke out in the scaffolding around the spire on Monday afternoon, Paris firefighters confirmed, adding that a major operation to tackle the fire is underway. The incident took place as the jewel of the Gothic architecture was undergoing a major overhaul costing €11 million ($ 12.43 million), with the work scheduled to be finished around 2022. The cathedral is home to works of art of incalculable value. There have been no reports of casualties. It is unknown what might have caused the fire. The medieval cathedral is one of the main attractions of the French capital, seeing 12 million tourists a year, more than the Louvre or the Eiffel Tower. On April 12 the World Health Organization published "Preliminary results on the efficacy of rVSV-ZEBOV-GP Ebola vaccine using the ring vaccination strategy in the control of an Ebola outbreak in the Democratic Republic of the Congo: an example of integration of research into epidemic response." (pdf). No time stamp on the report, nor on the news report about the report published at STAT. But given the three comments in response to the STAT report are dated the 13th, I'll venture it was published somewhat late in the day on the 12th. ... 75% of new Ebola cases have no obvious link to previous patients, meaning that officials have lost track of where the virus is spreading. Emanuele Capobianco, head of health and care at the International Federation of Red Cross and Red Crescent Societies, cited Congolese health ministry statistics showing 40 new cases over two days this week. He called the rate unprecedented in this outbreak. The outbreak has been like no other. Capobianco cited lack of trust about Ebola treatment in the community, which had never faced an outbreak of the virus before, and insecurity caused by rebel groups that have hurt aid efforts. Well, there goes the Ring Vaccination Tactic out the window. You can't vaccinate rings of people around somebody infected with a communicable disease if you don't know who the somebodies are. 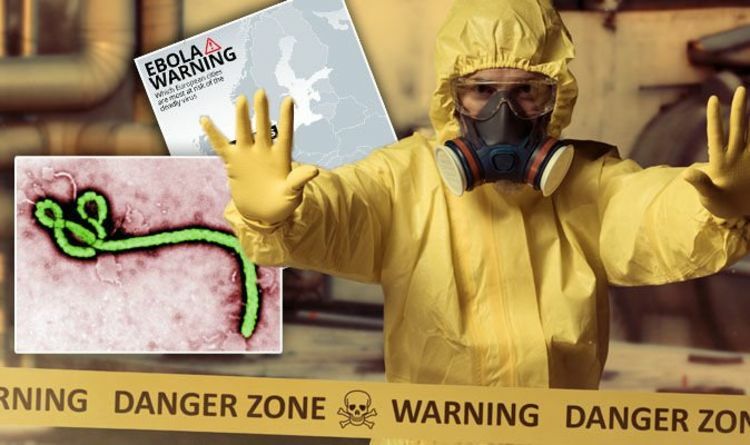 As the Director of the Center for Health Security of the Johns Hopkins Bloomberg School of Public Health put it, in what may turn out to be the Quote of the Year: "We have a high percentage of people who are appearing with Ebola after they’ve died." Sadly for Daniel Drezner, I don't think Dr Inglesby meant to imply Ebola-infected zombies are on the loose. Most probably his tongue just got a little tangled because he was upset about WHO's decision not to declare a global health emergency. Even worse upsets may be in store for everyone who placed hope in the use of an experimental Ebola vaccine for ring vaccinations, which you see depend on the vaccine actually working. The second question, which should have been answered transparently months ago is, where is the data on vaccine effectiveness? We aren’t talking about the studies from West Africa but what is going in the DRC. WHO has ignored multiple requests, and that issue is not going away. The Ugandans, Rwandans, and Sudanese [countries bordering DRC] are counting on that vaccine actually working as advertised. And the healthcare systems of Europe and US have an expectation that requires proactive management. Meanwhile we still have reports of healthcare workers dying [from Ebola] without indication of whether they were vaccinated. To return to Dr Wilson's question, it's absolutely vital to learn whether there have been documented failures of the new Ebola vaccine. Such documentation should be readily available if the vaccine had been administered to healthcare workers who'd died from Ebola. There are a number of reasons why even an effective vaccine could fail; e.g., if it needs to be refrigerated and various batches aren't stored at the proper temperature, or if the vaccinated person doesn't have enough time to build up immunity before exposure to the disease. Doctors Without Borders is calling for patients to be treated in existing health centers rather than Ebola-specific clinics: “It’s very clear that people do not like or trust the Ebola centers and they are not coming to be treated." I'll tell you what kind of mind. It's a mind that's not focused on curing people of a disease or alleviating its symptoms. Such is the mind of WHO. The World Health Organization is focused on working with vaccine manufacturers and governments in order to immunize the entire world population against all diseases that can be vaccinated against. That's who WHO is. Whatever the benefits of its focus, WHO is more concerned with the prevention of communicable diseases than with the curing of individuals who fall prey to disease. This means common sense can be the first casualty of the WHO approach to dealing with a lethal infectious disease outbreak. > HO Health Emergencies Response provided an update on the epidemiology of the outbreak in the Democratic Republic of Congo (DRC) and on the status of the Ebola response in North Kivu and particularly noted the important contribution of vaccination in reducing transmission. > SAGE re-visited the possible vaccination strategies by reviewing epidemiological data and impact modelling. It concluded that ring vaccination currently remains the most effective strategy in this DRC Ebola outbreak. Geographic targeting should remain as a fall-back strategy. Mass vaccination and ring plus had less favourable overall impact for the doses used in the modelling. > SAGE reviewed epidemiological data from North Kivu for children below 1 year of age and for lactating women. Although clinical data on the safety and efficacy of the rVSV-ZEBOV-GP Ebola vaccine for these two specific groups are absent, SAGE considers that the high attack rates and high case fatality rates for these groups, together with the accumulating data on vaccine safety and efficacy for other groups, justify inclusion of children who are above the age of 6 months and of lactating women in the ongoing ring vaccination efforts in North Kivu. > SAGE strongly urged the implementation of studies to evaluate additional Ebola candidate vaccines, including where possible in pregnant and lactating women and in infants. With new case numbers rising at an alarming rate, the World Health Organization said Wednesday it will again look at whether the Ebola outbreak in the Democratic Republic of the Congo should be declared a global health emergency. The announcement that a panel of outside experts — a so-called emergency committee — will meet Friday to debate the question came on a day when the DRC health ministry was expected to say 18 new Ebola cases had been identified. That marked the highest one-day increase in this epidemic, now in its ninth month. This will be the second time an emergency committee has been asked to advise WHO Director-General Tedros Adhanom Ghebreyesus on whether this outbreak meets the criteria to be declared a Public Health Emergency of International Concern, known in global health circles as a PHEIC [rhymes with "fake."] The committee met in October and though it described the outbreak as very worrying, it recommended against declaring a PHEIC at that time. To date the outbreak has not spread to other countries, which is thought to be one of the reasons a PHEIC has not been declared. But it is occurring in what is effectively a conflict zone, a reality that time and again has impeded the response team’s ability to bring transmission to a halt. As of Tuesday there have been 1,186 cases and 751 deaths. Every time there has been a surge in violence there has been a corresponding sharp rise in cases. But whereas the violence was directed at Congolese soldiers or the United Nations peacekeeping operation in the outbreak area last fall, increasingly the attacks have been directed at the Ebola outbreak response itself. In late February, Ebola treatment centers at Katwa and Butembo were firebombed by armed assailants, putting both out of commission for a time. Doctors Without Borders, which had been operating those treatment centers, withdrew its staff, saying it could not ensure their safety. Both centers have since reopened and are being operated by the DRC ministry of health and the WHO. Since those attacks, case numbers have soared, and an outbreak that looked in February like it was coming under control now looks far from it. Community resistance to the control measures known to stop Ebola transmission remains high in Katwa and Butembo, hotspots that are fueling the outbreak at this point. Many infected people are refusing to go to treatment centers for care, choosing instead to stay at home. That accelerates spread of the disease because the people who care for these patients will almost inevitably become infected themselves in the process. There was hope that an experimental Ebola vaccine, made by Merck, would help to contain the outbreak. And WHO officials insist that but for the vaccine, this outbreak would be many times more severe than it already is. More than 97,000 doses of the vaccine have been administered so far in this outbreak. But failings of the response are undermining the vaccine’s effectiveness. The vaccine is being used in what is called a ring vaccination approach — it is being offered to people who are known contacts of cases and the contacts of the contacts, as well as health workers and other frontline workers. The idea is to prevent spread of the virus by protecting people who are in contact with cases. For that approach to work, the Ebola response needs to be able to identify as many contacts as possible. But in many cases they have been unable to do the contact tracing work needed to draw up detailed lists; cases have occurred in neighborhoods or villages where it is unsafe for them to work. As a result, many people who should have been vaccinated have not appeared on the vaccination list. Ms. Branswell goes on to report that the prolonged length of the outbreak is raising concerns supplies of the vaccine will run out. But barring that possibility, only howling mobs of Doctors Without Borders workers descending on WHO's headquarters in Geneva might pry SAGE from the Ring Vaccination Tactic in DRC. DWB aka Médecins Sans Frontières is very, very upset about WHO's decision not to declare the DRC Ebola outbreak a global health emergency or a PHEIC (rhymes with "fake") or whatever -- although WHO walked right up to the line. In the wake of the decision, DWB/MSF brushed aside WHO's terminology and called the outbreak for what it has become -- maybe not in Geneva but down there on the ground in two provinces in DR Congo: an out-of-control epidemic. And while DWB/MSF stopped short of dismissing the vaccination approach, they issued an impassioned plea for a change in strategy in battling the epidemic, one that was patient- and community-oriented. But I'll give the last word to Dr Michael Osterholm, director of the University of Minnesota’s Center for Infectious Diseases Research and Policy. He summed the need for a new direction in combatting Ebola in DRC when he told Helen Branswell, "Doing the same thing over and over again does not appear to be working." Assange was taken into custody at a central London police station, and the arrest was made at a US extradition request, the Met Police have confirmed, saying he will appear at London Magistrates’ Court. 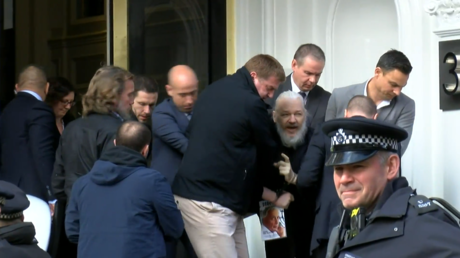 Julian Assange has been “further arrested on behalf of the United States authorities after his arrival at a central London police station,” the Metropolitan Police confirmed. The US cited the Extradition Act while filing the request, they informed. “He will appear in custody at Westminster Magistrates' Court as soon as possible,” the statement reads. A car apparently carrying Assange has arrived at the court earlier. Earlier in the day, Jen Robinson, one of Assange’s legal team, alleged that the arrest was linked to a US extradition request. “Just confirmed: Assange has been arrested not just for breach of bail conditions but also in relation to a US extradition request,” she tweeted. "Since December, protests triggered by the rise in consumer goods prices have engulfed Sudan. Mass rallies have prompted President Omar Bashir, who has been in power for 30 years, to dissolve the cabinet and declare a year-long state of national emergency." Ya mean the Doomsday Bug is a fungus?